Most high-traffic facilities rely on their doors to get products and vehicles in and out of the building quickly, which means choosing a company with enough experience and professionalism to install the right doors and service them is a high-stress task. Not to worry — O&L Door Systems has been working with the business owners of Eagan, MN for more than two decades, and we value you as a friend and neighbor. Maybe you just moved to a new facility and it’s time to install the perfect door for your building. You may also be replacing your door for higher performance or a more attractive building appearance. Whatever your reason is, installing new garage doors can be an exciting time if you choose a company you can trust. Improperly-installed doors can look uneven or become damaging and unsafe, but those done right offer benefits like faster movement, safer operations and a more appealing outward building appearance that attracts more customers. At O&L Door Systems, we’re a proud Authorized Clopay® Dealer, which means we deliver high-quality, long-lasting products with exceptional durability, style and functionality. Whether you own a restaurant, car dealership, shipping center, fire station or other facility, you’ll need to take your aesthetic preferences and other priorities into account before choosing your garage door and opener. We’ll always help you decide, so you’re sure to find the door with the perfect specifications, size, features and appearance in our extensive inventory. While the fact that your garage door will undergo wear and tear naturally isn’t something you can avoid even with the highest-quality brands on the market, you can opt in to reliable services to make sure you know what to do if something goes wrong. A broken door can trap crucial products and vehicles inside your building that you can’t get out until you get repairs. Call us right away if your door malfunctions, and we’ll send a technician immediately to diagnose and repair the issue. With so many moving components like springs, rollers, cables and more, your garage door could break down at the fault of countless different parts. If you try to use your door and notice strange noises, uneven movement, slow operations, hesitation to open the entire way, slamming or a complete failure to function, contact us to fix the problem. Our technicians know how to safely repair and replace any leading brand of doors, openers or accessories on the market, whether we installed them for you initially or not. You’ll eventually save money by opting for our preventative maintenance plans. We’ll be able to inspect your door regularly, complete annual tune-ups and ensure the entire system will operate at its highest possible performance for as long as possible. Natural wear and tear isn’t hard to keep up with if someone pays attention to it but left unattended it can cause the rest of your garage door system to fail, requiring a complete replacement. Trust our maintenance services to keep small issues from turning into large, expensive, time-consuming projects. Why Choose O&L Door Systems? At O&L Door Systems, it’s our goal to meet and exceed customer expectations anytime we’re performing services on a commercial garage door in the Eagan, MN, or surrounding area. We consider you neighbors, which means we want to provide you with the best possible experience within the desired timeframe. Don’t wait. 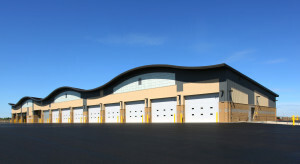 Contact us online or call (612) 623-1817 to get the exact commercial garage door you need!